The Bruce Clifton Exotics Copper Kettle Cherry 3/8 in. Thick x 5 in. Wide x Random Length Engineered Hardwood Flooring features planks that have a micro-bevel on all 4 sides. It is constructed of 5 ply cross grain engineered wood. This flooring comes prefinished in a medium color with a satin gloss. 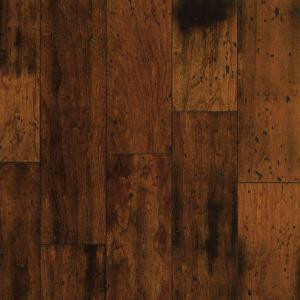 It has a vintage style and an antique-rustic finish, for an attractive flooring option. It is designed for residential applications. 28 sq. ft. per case. Case weight: 42 lb.